San Francisco's Right Window Gallery will host the first West Coast exhibit of Alan W. Bernheimer's Reflectographs, rare and unique photographic images created without a camera. The exhibit runs from April 2 to 30, with a gallery reception on Sunday, April 14 from 1 to 4 pm, at 992 Valencia Street. exposure to light, creating shadows. The dark shadows are "negatives" of the objects, and Reflectographs are negatives in the same sense, since the brightest parts of the light pattern produce the darkest tones in the final image, with gradations all the way to white, where no light falls. Bernheimer's innovation was to use reflected light patterns, rather than shadows of objects, to create the images. Initially he used household objects such as shiny metal or glass platters for reflectors. The texture or fine structure in some Reflectographs is a result of diffraction and interference caused by numerous microscopic scratches in the reflecting surface. Over time Bernheimer's work became increasingly sophisticated, evolving from stark figures on a white ground to more elaborate and suggestive images extending past the edge of the frame, with reflectors as diverse as hubcaps and mylar. 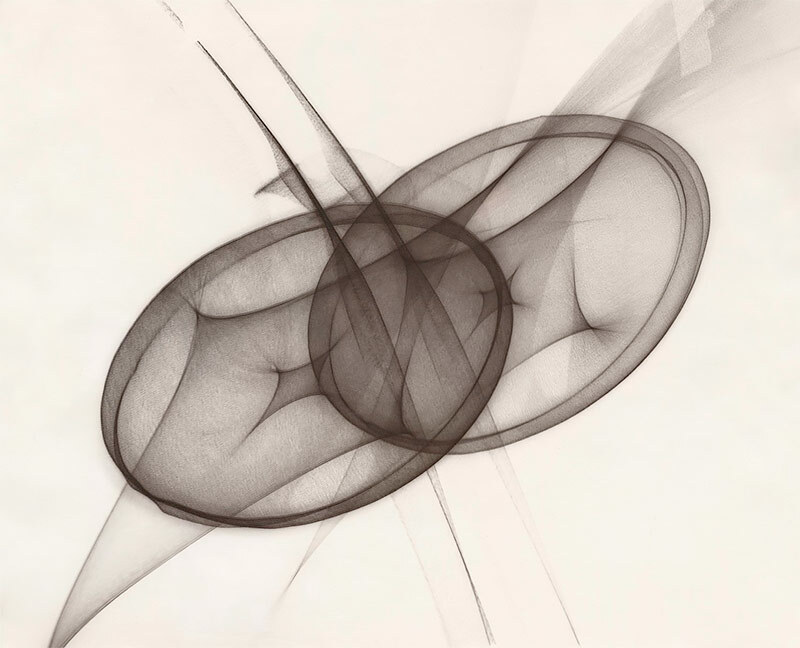 In his 2016 book, Emanations: The Art of the Cameraless Photograph, art historian Geoffrey Batchen says of the form that "Such photographs therefore reduce photography to its most essential feature: the reaction of a given surface to the absence and presence of light... Unmediated by perspectival optics, photography is here presented as something to be looked at, not through, and to be made, not taken."